Nevada Chemtrails: The politicians do nothing. The media remain silent. The photograph is of chemical clouds in the sky over Las Vegas. So many have been sick in what seems to be a direct correlation to exposure to these chemical clouds. 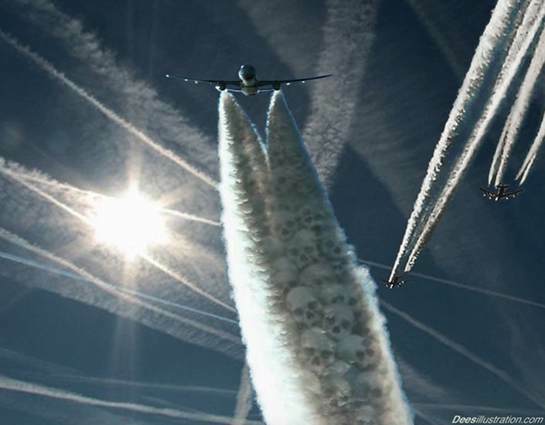 These chemical contrails are often laden with aluminum oxide (chaff) and barium powders, amongst many other heavy metals, mycoplasma and bio-toxins. Ingesting these heavy metals seems to be vastly increasing reported memory problems, mental fog, headaches, chronic fatigue, walking pneumonia, persistent cough, flu-like illness, recurring sinus and respiratory infections.